The highest service level is based on wired connectivity speeds. 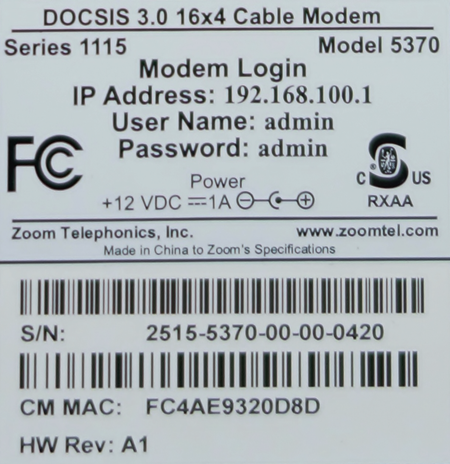 The Zoom 5370 has the following ports and button available on the back of the modem. Off No power - Verify power supply connections and electrical outlet. Ensure the outlet is not connected to a switch. Press the ON/OFF button on the back of the modem to ensure it is turned on. Blinking Blue Negotiating multiple downstream bonded channels - Verify all cable connections and try resetting the modem. Blinking Green Scanning for downstream channels - Verify all cable connections and try resetting the modem. Blinking Blue Negotiating multiple upstream bonded channels - Verify all cable connections and try resetting the modem. Blinking Green Scanning for an upstream channel - Verify all cable connections and try resetting the modem. Off No upstream channels are in use - Verify all cable connections and try resetting the modem. Off The modem is offline - Verify all cable connections and try resetting the modem. Off No device is connected or the device is disabled - Verify all cable connections and try resetting the modem.